The museum had a big event a few weeks ago, celebrating the 45th anniversary of the 1st “Intergalactic Spacewar Olympics.” Just a couple of weeks before said event, the museum acquired a beautiful Digital Equipment Corporation Lab-8/e minicomputer and I thought it would be an interesting challenge to get the system restored and running Spacewar in time for the event. As is fairly obvious to you DEC-heads out there, the Lab-8/e was a PDP-8/e minicomputer in a snazzy green outfit. It came equipped with scads of analog hardware for capturing and replaying laboratory data, and a small Tektronix scope for displaying information. 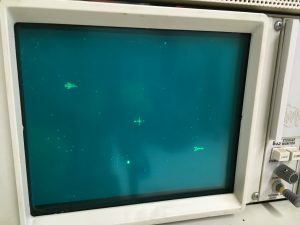 What makes this machine perfect for the PDP-8 version of Spacewar is the inclusion of the VC8E Point Plotting controller and the KE8E Extended Arithmetic Element (or EAE). The VC8E is used by Spacewar to draw the game’s graphics on a display; the EAE is used to make the various rotations and translations done by the game’s code fast enough to be fun. The restoration was an incredibly painless process. I started with the power supply which worked wonderfully after replacing 40+ year old capacitors, and from there it was a matter of testing and debugging the CPU and analog hardware. There were a few minor faults but in a few days everything was looking good, so I moved on to getting Spacewar running. But which version to choose? There are a number of Spacewar variants for the PDP-8, but I decided upon this version, helpfully archived on David Gesswein’s lovely PDP-8 site. 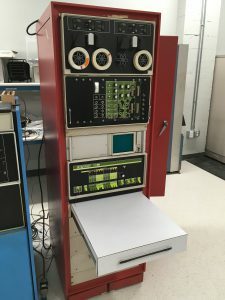 It has the advantage of being fairly advanced with lots of interesting options, and the source code is adaptable for a variety of different configurations — it’ll run on everything from a PDP-12 with a VR12 to a PDP-8/e with a VC8E. Loading and running the program yielded an empty display, though the CPU was running *something*. This was disappointing, but did I really think it’d be that easy? After some futzing about I noticed that if I hit a key on the Lab-8/e’s terminal, the Tektronix screen would light up briefly for a single frame of the game, and then go dark again. Very puzzling. 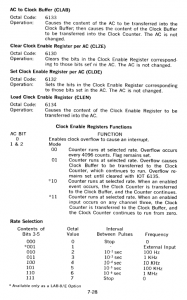 The bit relevant to our issue is in bold above; the CLLR IOT instruction is used to load the DK8-EP’s clock control register with the contents of the 8’s Accumulator register (in this case, loaded with the value 5300 octal by the previous instruction). The comments suggest that this sets a 1 Khz clock rate, with an interrupt every time the clock overflows. Bit 0 set: Enables clock overflow to cause an interrupt. Bits 1&2 set to 01: Counter runs at selected rate. Bits 3,4&5 set to 001: 1Khz clock rate. (Keep in mind that the PDP-8, like many minicomputers from the era, numbers its bits in the opposite order of today’s convention, so the MSB is bit 0, and the LSB is bit 11.) So the comments in the code appear to be correct: the code sets up the clock to interrupt, and it should be enabled and running at a 1Khz rate. Why wasn’t it interrupting? I wrote a simple test program to verify the behavior outside of Spacewar, just in case it was doing something unexpected that was affecting the clock. It behaved identically. At this point I was beyond confused. But wait: The diagnostic was passing — what was it doing to make interrupts happen? Bits 1+2 unset: Counter runs at selected rate, and overflows every 4096 counts. Bit 8 set: Events in Channels 1, 2, or 3 cause an interrupt request and overflow. So this seems pretty similar to what the Spacewar code does (at a different clock rate) with one major difference: Bit 8 is set. Based on the description in the Small Computer Handbook having bit 8 set doesn’t make a lot of sense — this test isn’t testing channels 1, 2, or 3 and this code doesn’t configure these channels either. Also, the CLOE vs CLDE mnemonic difference is odd. All the same, the bit is set and the diagnostic does pass. What happens if I set that Clock Enable Register bit in the Spacewar code? Changing the TAD (5300 instruction to TAD (5310 is a simple enough matter (why, I don’t even need to reassemble it, I can just toggle the new bits in via the front panel!) and lo and behold… it works. That’s definitely CLOE, not CLDE. 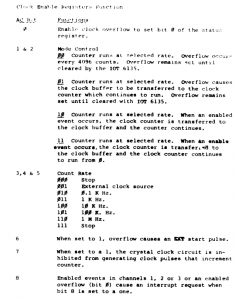 The engineering drawings date from January 1972 (first revision in 1971), while the 1972 edition of the PDP-8 Small Computer Handbook has a copyright of 1971, so they’re from approximately the same time period. I suspect that the programming information given in the Small Computer Handbook was simply poorly transcribed from the engineering documentation… and then Spacewar was written using it as a reference. There is a good chance given that this version of Spacewar supports a multitude of different hardware (including four different kinds of programmable clocks) that it was never actually tested with a DK8-EP. Or perhaps there actually was a hardware change removing the requirement for bit 8 being set, though I can find no evidence of one. So with that bug fixed, all’s well and our hero can ride off into the sunset in the general direction of the 2017 Intergalactic Spacewar Olympics, playing Spacewar all the way. Right? Not so fast, we’re not out of the woods yet. Stay tuned for PART TWO!